Delnavazi, M., Banihashem, M., Farsam, H., Shafiee, A., Yassa, N. (2016). Pyrrolizidine alkaloids from Heliotropium transoxanum Bunge. Research Journal of Pharmacognosy, 3(1), 1-5. M. R. Delnavazi; M. Banihashem; H. Farsam; A. Shafiee; N. Yassa. "Pyrrolizidine alkaloids from Heliotropium transoxanum Bunge". Research Journal of Pharmacognosy, 3, 1, 2016, 1-5. Delnavazi, M., Banihashem, M., Farsam, H., Shafiee, A., Yassa, N. (2016). 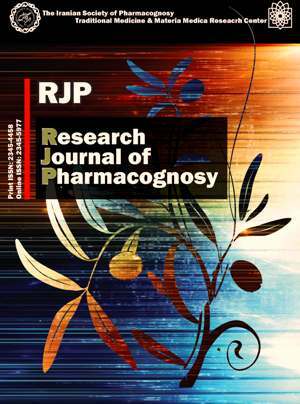 'Pyrrolizidine alkaloids from Heliotropium transoxanum Bunge', Research Journal of Pharmacognosy, 3(1), pp. 1-5. Delnavazi, M., Banihashem, M., Farsam, H., Shafiee, A., Yassa, N. Pyrrolizidine alkaloids from Heliotropium transoxanum Bunge. Research Journal of Pharmacognosy, 2016; 3(1): 1-5. 2Department of Medicinal Chemistry, Faculty of Pharmacy, Tehran University of Medical Sciences, Tehran, Iran. Background and objectives: The plants belonging to the genus Heliotropium L. (Boraginaceae) are the main sources of toxic pyrrolizidine alkaloids (PAs). In the present study, we have investigated the PAs of the aerial parts of Heliotropium transoxanum Bunge, a perennial species native to Iran. Methods: Silica gel column chromatography and silica gel PTLC were applied for the isolation of PAs present in the total methanol extract of H. transoxanum. The structures of the isolated compounds were identified using 1H-NMR, 13C-NMR and EIMS spectral analyses. Results: Three PAs, heliotrine (1), lasiocarpine (2) and heliotrine N-oxide (3),with known mutagenic and genotoxic properties, were isolated from the aerial parts of H. transoxanum. Conclusion: The results of this study on the presence of toxic PAs in H. transoxanum introduce this herb as a poisonous species and also suggest it as an appropriate source for the isolation of heliotrine and lasiocarpine for further toxicological and pharmacological studies.